* Please note these could take 3-6 weeks for delivery. For faster delivery, please contact us at (800) 323-6144 and ask about our Expedited Service for an additional fee. 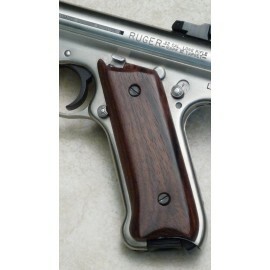 We developed a special high quality material suitable for use in Gun Grips and Knife handles. Our proprietary process creates a line of high grade acrylic material that we call Kirinite®. Unlike gun grips available from others, Kirinite® is not an inferior plastic molded material. Not all acrylics are plastics - and no other acrylic is exactly like Kirinite®. Kirinite® has dazzling rich vibrant colors and is extremely durable. When hand-finished and polished, it transforms into the perfect grip material. Photographs just don’t do Kirinite® justice. You must see, touch and hold Kirinite® with your own hands in order to experience the rich colors and just what it does for your guns. Guns are very personal and should reflect the owner’s special tastes and style. Grips made from Kirinite® are anything but slippery - the more Kirinite® is polished, the more it grabs and bonds to the hand. Since there is virtually no limit to the incredibly rich colors and patterns that can be created with Kirinite®, there is an endless variety that can be created with this material – and no two Kirinite® grips are exactly alike! Our Kirinite® grips are made on the latest CNC equipment and finished by hand using the finest sanding & polishing equipment available. No one can shape or finish Kirinite® quite like we can, because we introduced it, “it's our own unique material”. *Please allow at least 2-4 weeks for these completely handcrafted grips to be delivered via USPS Priority Mail. Pictures may not be specific. Great fit and feel. Quality product. They look great on the gun, perfect fit and so comfortable. The gun feels so much better in your hand compared to the factory grips. Thanks Eagle for such a great product.